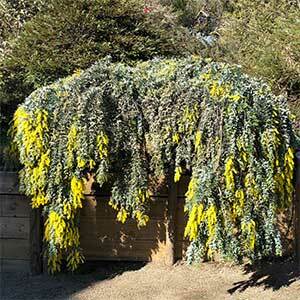 The Cootamundra Wattle is a fast growing small tree, and has been popular for many years with gardeners. In our mind Acacia baileyana looks best when grafted as a standard, this treatment slows the growth rate and it achieves a wonderful weeping effect. Propagation is from seed as well as from grafted cuttings. This is a tree that can be coppiced every 4 – 6 years. Simply prune it back to ground level and it will re shoot. 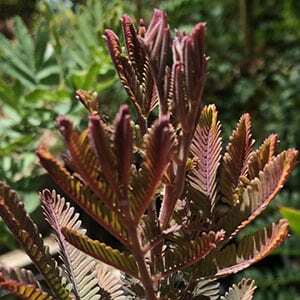 You can also look for Acacia baileyana Purpurea, the new foliage emerges a purple colour. Common Name – Cootamundra wattle. Height – To around 4 – 7 metres plus. Flowers – Golden Yellow small and rounded.